The reaction sintering of β-sialon (Si4Al2O2N6) from a powder mixture of Si3N4, Al2O3 and AIN was studied to clarify factors affecting the densification. The presence of sufficient SiO vapour on the compact and excess oxide with respect toβ-sialon composition was the most important factor. High densityβ-sialon was fabricated by heating the compact at 1800° C under 1 atm. N2. 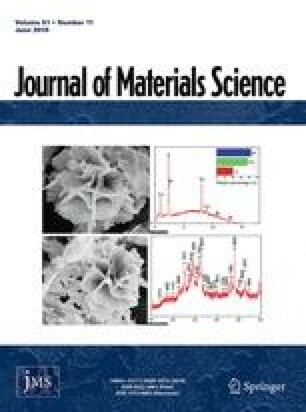 The sintering was carried out with sufficient SiO vapour pressure to prevent thermal decomposition of sintered sialon by packing the compact with a powder mixture of Si3N4 and SiO2. Care was taken to minimize the amount of excess oxide in the starting composition to obtain a high density sialon with a small amount of intergranular X-phase. The maximum density of 3.04 g cm−3 was obtained from the compact with 2 wt % excess Al2O3 in the composition. The strength of the sinteredβ-sialon was 490 MN m−2 at room temperature and 480 MN m−2 at 1200° C. The values are the best among those so far published for sinteredβ-sialons.